One of the earliest butterflies to emerge after the snow melt is also among the prettiest in the mariposa world: the mourning cloak. Adorned in the robe of honor, the butterfly’s wings are purple and blue and black and hemmed with yellow (gold). As it flies toward the viewer, it appears to be as big as a kite, but the deceptive gold edges of its cloak make it hard to catch (with a net) and easy to identify (with binoculars). It takes the human eye a moment to adjust to the spring light and to see this beauty of this insect for what it is worth: pure royalty. 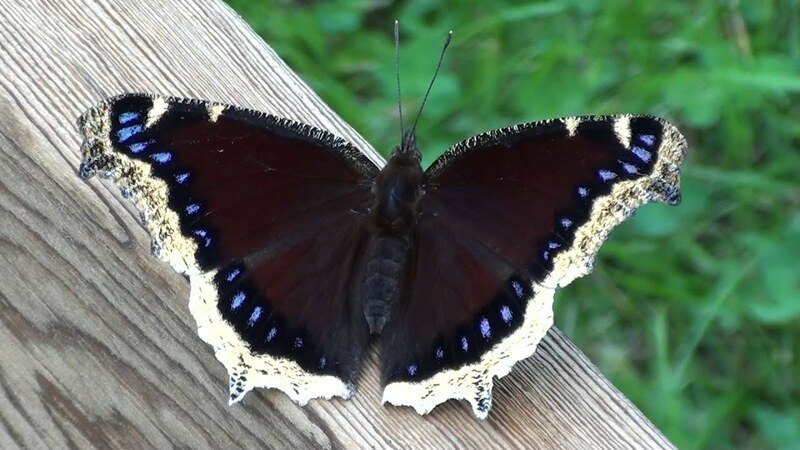 In North America, the mourning cloak is known by its Latin name Nymphalis antiopa, and in Britain it is known as the Camberwell Beauty. It is a large butterfly by butterfly standards, and it is native to Eurasia and North America. The immature form of this species is sometimes known as the spiny elm caterpillar. Other older names for this butterfly species include Grand Surprise and White Petticoat. A powerful flier, this species is sometimes found in areas far from its usual range during migration. These butterflies live for slightly less than a year. Having a lifespan of 11 to 12 months, it is actually one of the longest life-span for any butterfly in the lepidoptery universe.